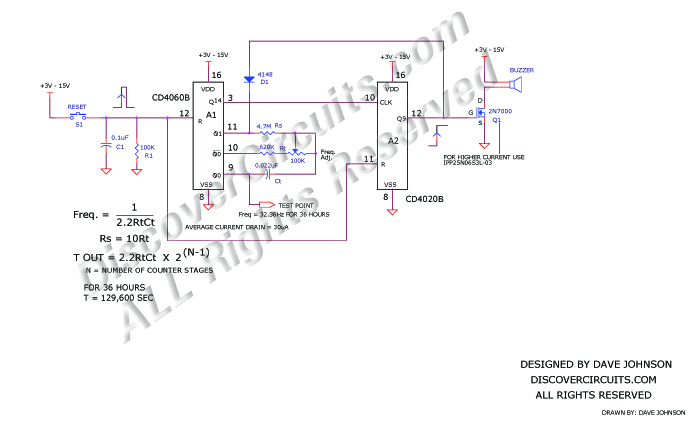 Circuit: #36336 Hour Watchdog Timer__ Circuit s designed by David A. Johnson, P.E. A watchdog timer is often used in computer systems to detect when a computer is hung up and is no longer running properly. If it does become locked up and is not able to supply a reset pulse to the circuit within a defined time frame the timer times out and activates some kind of alarm. Watchdog timers can also be used for humans. As in the computer, if the human fails to press the reset button in the circuit below, an alarm buzzer is activated. The circuit uses two common logic ICs. The CD4060 contains an oscillator and a number of logic dividers. The output of the first counter is fed to the second timer. With the component values given, the timer is set for a timeout after 36 hours. It is very easy to change the oscillator frequency or the number of counter stages to program the circuit for longer or shorter times. I have supplied the formulas for determining the component values.